Using the Pattern Discovery Engine™ coupled with a hypothesis-free approach, we analyzed a large dataset of 50 human microbiome samples, each with the relative abundance of the ~10,000 KEGG protein families. We identified 39 KEGGs that were significant in differentiating the disease states from each other and from healthy, with 9 of the KEGGs (out of 10K total) being most associated with a dynamic path from disease to health in the human-gut microbiome. Using our approach we were able to reduce the size of the dataset to be analyzed by three orders of magnitude. KEGG (Kyoto Encyclopedia of Genes and Genomes) is a knowledge base for systematic analysis of gene functions, linking genomic information with higher order functional information. The genomic information is stored in the GENES database, which is a collection of gene catalogs for all the completely sequenced genomes and some partial genomes with up-to-date annotation of gene functions. 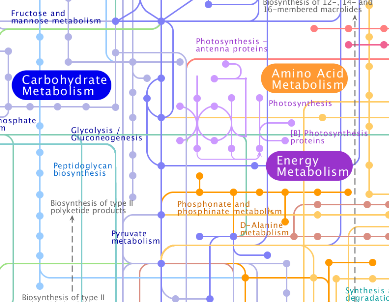 The higher order functional information is stored in the PATHWAY database, which contains graphical representations of cellular processes, such as metabolism, membrane transport, signal transduction and cell cycle. Or in plain english, it is show what produces, consumes or influence processing of chemicals in nature (including the human body and the microbome in your gut). We are getting into complex areas which makes a Gordian knot look like a straight piece of rope. Further research into these nine KEGG protein families revealed that six of the nine KEGG protein families identified are related to oxidative phosphorylation. IBD, like other inflammatory diseases, may be associated with abnormal oxidative phosphorylation or oxidative stress . Oxidative phosphorylation produces reactive oxygen species (ROS) in both prokaryotes and in the mitochondria of eukaryotes. Microbial ROS production affects the innate immune response, influencing the integrity of the intestinal epithelial barrier (2) which is compromised in IBD. Path ways: K00330, K00348, K00351, K00434, K00604, K00607, K00609, K00633, K03671. While the sample sizes were small (and likely not widely distributed geographically), the results are definitely interesting. It does point to reducing oxidative phosphorylation and inhibiting reactive oxygen species as desired paths forward (and likely topics for future posts). how do i find out what species react to oxygen and how do i reduce oxidative phosphorylation.